STORAGE SPACES DIRECT (S2D) FOR SQL SERVER FAILOVER CLUSTER INSTANCES (FCI)? With the introduction of Windows Server 2016 Datacenter Edition a new feature called Storage Spaces Direct (S2D) was introduced. At a very high level, this solution allows you to pool together locally attached storage and present it to the cluster as a CSV for use in a Scale Out File Server, which can then be accessed over SMB 3 and used to hold cluster data such as Hyper-V VMDK files. This can also be configured in a hyper-converged (HCI) fashion such that the application and data can all run on the same set of servers. This is a grossly over-simplified description, but for details, you will want to look here. Why would anyone want to do that? Well, for starters you can now build a highly available 2-node SQL Server Failover Cluster Instance (FCI) with SQL Server Standard Edition, without the need for shared storage. Previously, if you wanted HA without a SAN you pretty much were driven to buy SQL Server Enterprise Edition and make use of Always On Availability Groups or purchase SIOS DataKeeper and leverage the 3rd party solution which lets you build SANless clusters with any version of Windows or SQL Server. SQL Server Enterprise Edition can really drive up the cost of your project, especially if you were only buying it for the Availability Groups feature. When comparing the two solutions, you have to take into account that SIOS has been allowing you to build SANless Clusters since 1999, while the S2D solution is still in its infancy. Having said that, there are bound to be some areas where S2D has some catching up to do, or simply features that they will never support simply due to the limitations with the technology. I’ve been talking to a lot of customers recently who are reporting some performance issues with S2D. When I tested S2D vs. DataKeeper about a year ago I didn’t see any significant differences in performance, but I did see S2D used about 2x the amount of CPU resources under the same load. This probably has to do with the high hardware requirements associated with S2D such as RDMA enabled networking and available Flash Storage, typically only available in the most expensive cloud based images. But beyond the cost and platform limitations, I think the most glaring gap comes when we start to consider that S2D does not support Availability Zones or disaster recovery configurations such as multi-site clusters or Azure Site Recovery (ASR). Allan Hirt, SQL Server Cluster guru and fellow Microsoft Cloud and Datacenter Management MVP, recently posted about this S2D limitation. In his article Revisiting Storage Spaces Direct and SQL Server FCIs Allan points out that due to the lack of support for stretching S2D clusters across sites or including an S2D based cluster as a leg in an Always On Availability Group, the best option for DR in the S2D scenario is log shipping! This even includes replicating across Availability Zones in either Azure or AWS. Microsoft does not make it clear in their documentation, but Microsoft’s own PM for High Availability and Storage makes it perfectly clear in the Microsoft forums. Deploying S2D cluster nodes within the same Availability Zone defeats the purpose of failover clustering and the deployment does not qualify for the AWS 99.99% SLA. Even if you wanted to deploy S2D in a single Availability Zone the deployment becomes even more complicated because it is recommended that you deploy at least three cluster nodes and each node must reside in its own subnet due to some AWS networking restrictions that requires each cluster node reside in a different subnet. S2D was never designed to run in different subnets, which further complicates the solution in terms of client redirection. In contrast, the SIOS DataKeeper solution fully supports Always On Availability Groups, and better yet – it can allow you to stretch your FCI across sites to give you the best HA/DR solution you could hope to achieve in terms of RTO/RPO. DataKeeper supports Availability Zones and DR configurations that cross cloud regions. In an Azure environment, DataKeeper also support Azure Site Recovery (ASR), giving you even more options for disaster recovery. Further complicating any S2D deployment in AWS is the reliance on “local instance store” storage, AKA, non-persistent ephemeral disks. Reliance on ephemeral storage puts your data at risk any time a disk rebuilds, which can happen at any time, but always happens when an instance is stopped. If a disk is lost and a second disk is lost before the first disk rebuilds you are looking at complete data loss and a restore from backup. If someone accidentally stops all the nodes in your cluster your data will be lost! Even if you take care to only stop one node at a time if you are not paying attention and waiting for a disk to complete a rebuild after you stop the second node you will also experience complete data loss! SANless clustering is particularly interesting for cloud deployments. 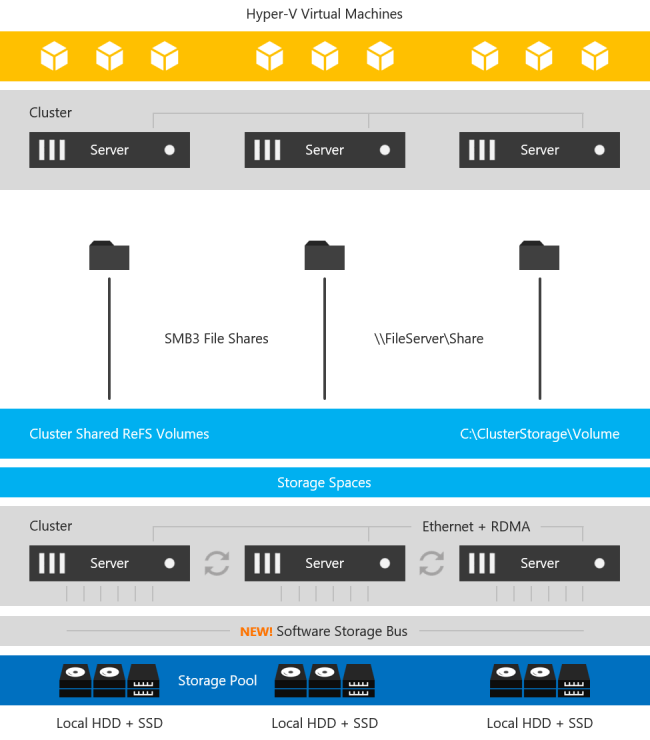 The cloud does not offer traditional shared storage options for clusters. So for users in the middle of a “lift and shift” to the cloud that want to take their clusters with them they must look at alternate storage solutions. For cloud deployments, SIOS is certified for Azure, AWS and Google and available in the relevant cloud marketplace. While there doesn’t appear to be anything blocking deployment of S2D based clusters in AWS or Google, there is a conspicuous lack of documentation or supportability statements from Microsoft for those platforms.